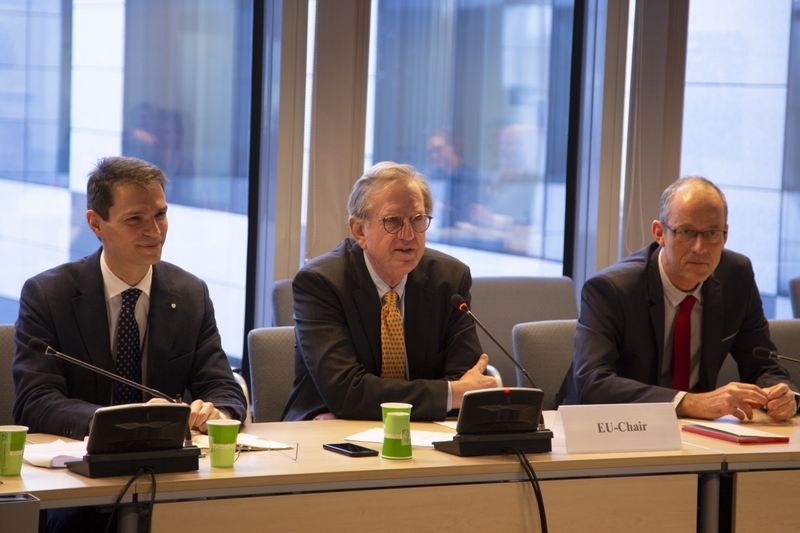 The EEA Joint Committee was chaired on the EU side by Mr Claude Maerten. The Standing Committee of the EFTA States and the EEA Joint Committee met in Brussels on 28 and 29 March respectively. At the Joint Committee meeting, 52 decisions (JCDs) were adopted, incorporating a record number of 234 EU legal acts into the EEA Agreement. This led to a substantial reduction of the total number of outstanding acts often referred to as the EEA Backlog. “We would like to express our great satisfaction with the number of outstanding acts which is now reduced by more than one third. This breakthrough was made possible thanks to close dialogue and cooperation with the EU,” said EEA EFTA Chair, Ambassador Sabine Monauni. The main reason for this milestone is due to the large number of acts in the field of financial services; these packages of acts make up 155 of the total 234 acts incorporated on 29 March. Most prominent of the packages of acts incorporated are the Capital Requirements Directive and Regulation (CRR/CDR IV), the Markets in Financial Instruments Directive and Regulation (MiFID II/MiFIR) and the Prospectus Regulation and related secondary legislation. The CRR/CRD IV rules lay down prudential requirements for capital risk and other risks for investment firms and credit institutions, capital buffers, bankers’ remuneration and bonuses along with prudential supervision and corporate governance. The MiFID II/MiFIR rules are intended to reinforce rules on the security markets and strengthen the protection of investors by introducing requirements on the organisation and conduct of actors in these markets. The EEA Joint Committee also took note of the two EEA EFTA Comments submitted to the EU side. One of these Comments concerns the notification procedure under the Services Directive, and the other is a Comment on the Rights and Values Programme. Pictures from both meetings can be found here. Provisional texts of EEA Joint Committee Decisions in 2019.